In April, my roommate moved into her new flat. The neighbours came into my house, to see what’s going on, in the house. Is there any PG college in this city? I want to take admission into it. In the given examples, in and into are used in a variety of ways. In the first example, ‘in’ is used to indicate ‘during’, whereas ‘into’ is used to indicate ‘shifting’. 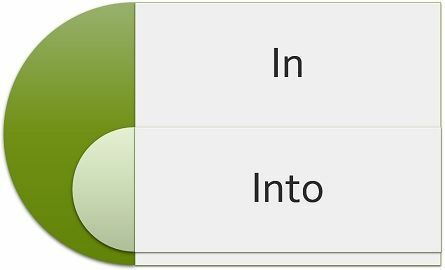 In the second example, ‘into’ refers to ‘entering’, while ‘in’ implies ‘inside’. In our last example, ‘in’ is used to talk about ‘a particular area’, whereas ‘into’ implies ‘entrance to something’. Meaning 'In' is used when something is within, i.e. one thing contains another. When someone or something comes from outside to the inside, we use the word 'into'. Used When someone or something is in rest. When someone or something is in motion. Example I am living in Dubai. Milk is converted into curd. In 1947, India got independence. The child fell into the pothole. He works in Microsoft. Nine into nine goes eighty one. Is there is any key in my purse? They live in the outskirts of Mumbai. There are no medicines in the box. Paul was swimming in the river. Kate is waiting for you in the park. Don’t talk in my class. Joe works as the team leader in the company. In 2016, she went to the UK for studies. She met an accident in 2014, in which she lost her legs. In my spare time, I love to watch movies. It can also be used to indicate before something ends. Lunch will be served in 5 minutes. I will call you in ten minutes. The flight leaves in 15 minutes. She said you are in web publishing. I was reading the newspaper when Robin came into the room. Diana is putting her mobile phone into the hand purse. The candidates are not allowed to bring electronic devices into the exam hall. Then, the snake turned into a man. The book is divided into different units. Shael crashed his car into a road divider. He read the documents thoroughly to gain insight into the matter. We’ll take the records into consideration. Five into two is equal to ten. ‘In’ is used to express a state when the object is or seems to be covered or enclosed by another object. On the other hand, ‘Into’, is used to express a movement of the object resulting in the enclosure of that object by a particular area. While we use ‘in’ to talk about the position of the object, ‘into’ is used when we are discussing the destination of the object. ‘In’ is commonly used when something is in ‘rest’ or not ‘in motion’. As against, ‘into’ is used when something is either moving or transforming. While the word ‘in’ can be used as a noun, adjective, adverb and preposition, ‘into’ can only be used as a preposition. My father is in politics. The boy in the black shirt is his brother. Rini is going into the hospital. The policeman rushed into the building. Throw the garbage into the dustbin. The words, in and into are quite similar in their meaning, but their difference lies in the fact that ‘into’ is used when someone or something moves to another location which is an enclosed one. Conversely, ‘in’ is used when something is already in a resting position in an enclosed space.